The information you find here draws on the experience of a handful of pioneering digital painters. It is independent, revenue-free, regularly updated, and offered without cookies. The text has been dedicated into the Public Domain by a CC0 1.0 universal license. You are free to copy, print and use it in any way you like. The images are protected by copyright unless otherwise stated. This website attracts thousands of visitors worldwide every month. Digital artists, you can let collectors know what you are doing while increasing traffic to your portfolio by linking this site to yours. Share the effort to promote a better understanding of digital painting! 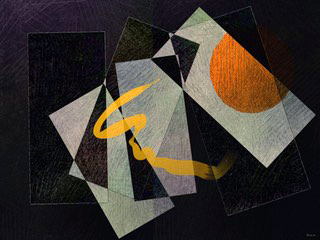 A 'digital' painting is created on the computer using a graphics program, a virtual paintbox with brushes, colors and other supplies. The definition applies to a painting on its primary digital carrier (as a computer file) as well as when it is transferred in a non-manual process to a secondary physical carrier (printed on paper, acrylic glass, aluminum, canvas, etc). The flatness of the physical representation is typical for the digital medium. It is possible to create a convincing illusion of texture on the virtual canvas, but not to translate this to real texture on paper, dibond, perspex etc. In most programs it is possible to undo all or a large number of brush strokes and other actions without a trace. No longer can a painting be spoiled with one stroke. The 'undo' and the many push-button transformations give digital painters the freedom to work faster, freely make mistakes and take a more experimental and spontaneous approach to their work. 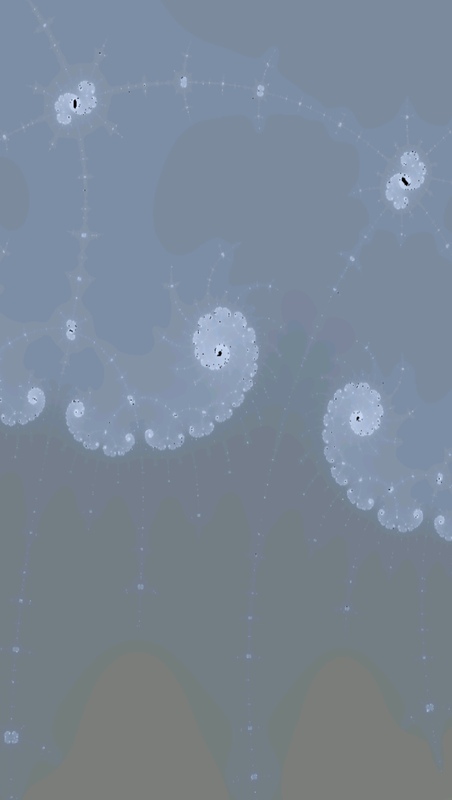 The creation of computer generated images in particular can be unprecedently quick and spontaneous. As to the brushstroke, it should be noted that manual vector painting involves the manipulation of shapes with a specific tool, which is a slower and more deliberate process than stroke-by-stroke painting. However, the undo and push-button transformations are available for manual vector as well. While 'art' is usually defined as 'human' creative skill and imagination, it becomes increasingly difficult to assess to what extent a painting is the result of human effort. The difference in method is probably best expressed by the influence that the artist exerts on the final result. In traditional painting this influence is perforce 100 percent. This is still true for raster painting and manual vector. 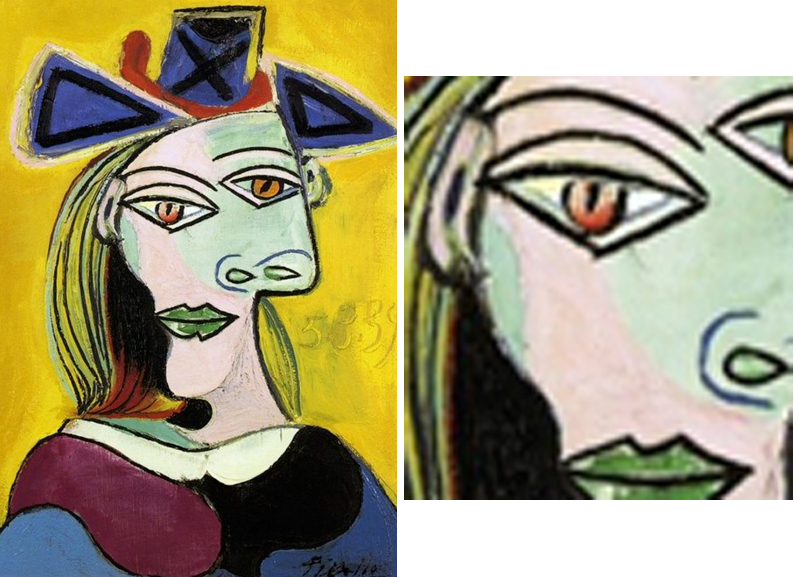 For computer generated painting it varies from 0 to 100 percent, depending on the software, the chosen framework and the preferences of the artist. The method can be a process of construction when the artist originates the image and uses input parameters or a set of rules to determine the final result. 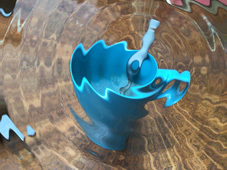 It is a process of play when the artist uses a push-button transformation and plays with the input parameters until the generated image is to his or her taste. And it is a process of selection when the artist makes a series of automated push-button transformations and selects a generated image without changing it. When the digital artist is done, the painting is on the hard disk of a computer. In order to sell it, it will have to be transferred to a physical carrier like dibond, fine art paper, acrylic glass, etc. What happens to the primary digital carrier depends on how the artist wants to offer the painting. If the print is sold as an original, the digital carrier is either deleted or transferred to the buyer. If it is offered as a series, the artist deletes the digital carrier when the prefixed number of copies is sold. For an open ended series, the digital carrier remains on the hard disk of the computer. The buyer should be informed about the status of the digital carrier. Obviously, forms and shapes that are typical for digital painting cannot be transmitted to a physical carrier in a manual process. The digital characteristics would be lost. The implication is often under-emphasized: a digital artwork, in its physical representation, is and can only be a print. If an artwork that was created on a computer is printed on canvas and, as is often the case, painted over with real paint, the result is a traditional painting but the original work on the computer still meets the definition of a digital painting. It is a common misunderstanding that a print cannot be a numerously unique work of art. It can and often is. There are a number of ways to protect uniqueness and limited editions. The artist should protect full-size, high resolution files of the artwork by choosing safe methods of transfer and sharing full scale files only with printing companies that delete them after use. Depending on the difference in scale between the original and the online image, raster and combined vector-raster paintings can be effectively protected by using low resolution and small size files for online display. Stronger measures such as DAM are needed to protect duplication and enlargement of online vector paintings. PAM (physical asset management) consists of a manual signature and/or a unique mark both on the printed artwork and the certificate. The mark establishes authorship and protects prints from duplication. With a GS1 or EAN code an artwork (any product) is identified worldwide with a unique number. The number is translated into a small image like a barcode or a datamatrix which can be attached to the certificate and the printed artwork. GS1 codes are issued in over 100 participating countries. DAM (digital asset management) is used to establish authorship of the digital image and to prevent it from being copied and used to produce prints and certificates without marks or with forged marks. A unique digimark is registered and embedded in the code of the image. Other than a digital watermark, that is placed over the image and can easily be removed, an invisibly embedded digimark survives a variety of manipulations and transformations, even duplication by screenshot. Digimarks are optionally supplemented with a search service that crawls the Internet tracing and reporting copies. 'Computer generated' does not necessarily mean that the computer creates the image. 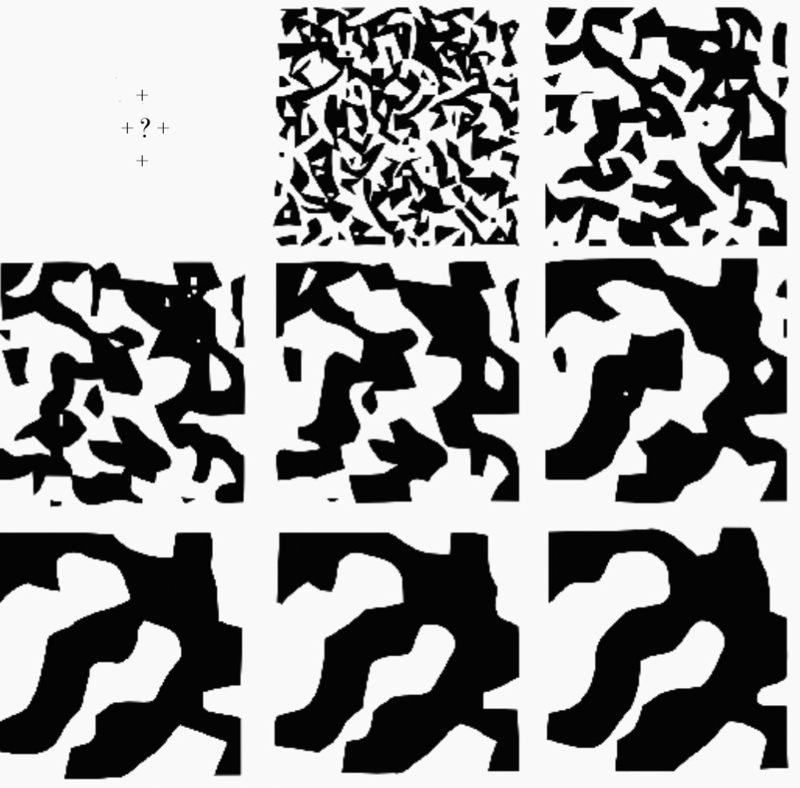 The somewhat confusing 'generated' only refers to the indirect painting method: the artist doesn't create the artwork by hand but instructs the computer how to do it. Like a composer who creates music, not by playing it on an instrument but by writing music notes on a score. To avoid misunderstanding it would perhaps be better to distinguish between computer-created and computer-executed. The method goes back to the early days of artificial intelligence. Prescriptions for all forms and lines had to be manually described by a mathematical formula. Since the 1970s, the mathematical formulas and calculations that are needed to construct the image are now taken care of 'behind the screen'. Generated images can be combined with photography and painting. Depending on the software, they are stored as raster or vector. 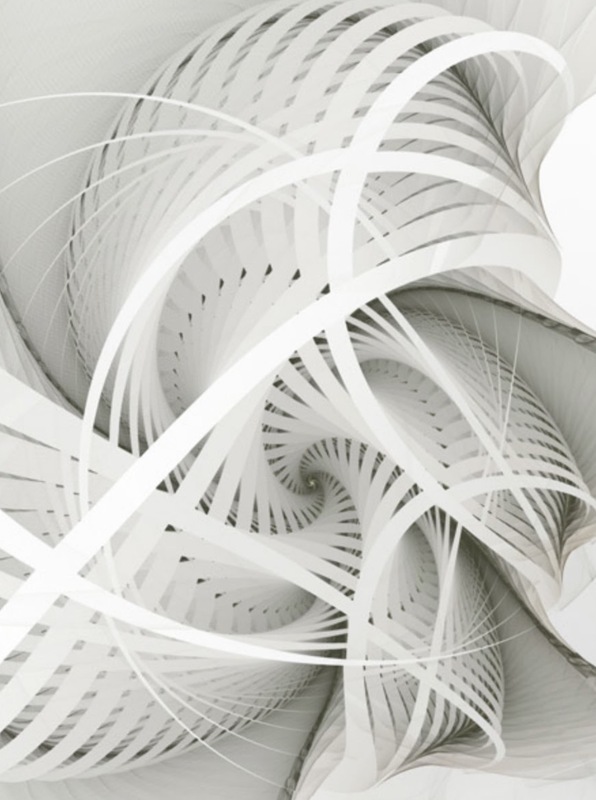 The essence of computer generated art is the possibility to command the computer, in a language of formulas, to create lines, forms and colors. Some of these formulas generate patterns that infinitely repeat themselves. However far you zoom in, you will always see new fragments of the same pattern. These self-repetitive forms are called fractals: 'geometrical shapes that can be split into parts, each of which is a reduced-size copy of the whole'. Mandelbrot set (in black). Click the image to zoom in. An infinitely self-repetitive pattern was first studied around 1918 by the French mathematicians Pierre Fatou and Gaston Julia. Their pioneering work was forgotten until Benoit Mandelbrot mentioned them 60 years later in his work about fractal geometry. 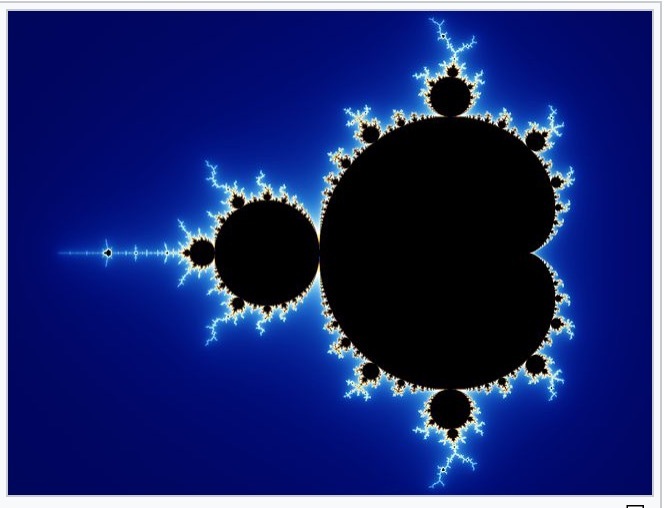 In honor of Mandelbrots work in fractals, others named the specific points generated by Mandelbrots equation that was similar to that of Fatou and Julia the 'Mandelbrot set'. In 1978 the American mathematician Robert Brooks first programmed a visualisation and thereby introduced fractals in the field of arts. 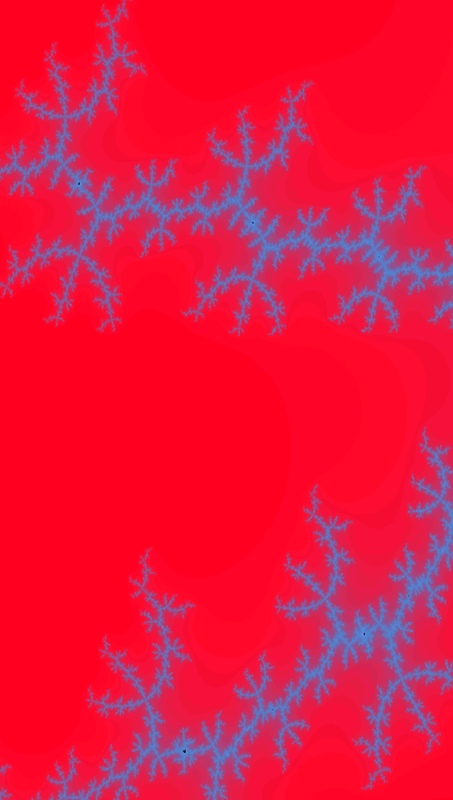 In painting software, the process to generate Mandelbrot images is pre-determined, based on the Mandebrot equation. Personal choices are possible for colors but not for forms. Images are truly generated, the result of a process of selection. In 1968, the Hungarian theoretical biologist Aristid Lindenmayer developed geometrical patterns aimed at describing the growth process of plants. In painting software, this mathematical framework is used to create patterns of lines, shapes and color. 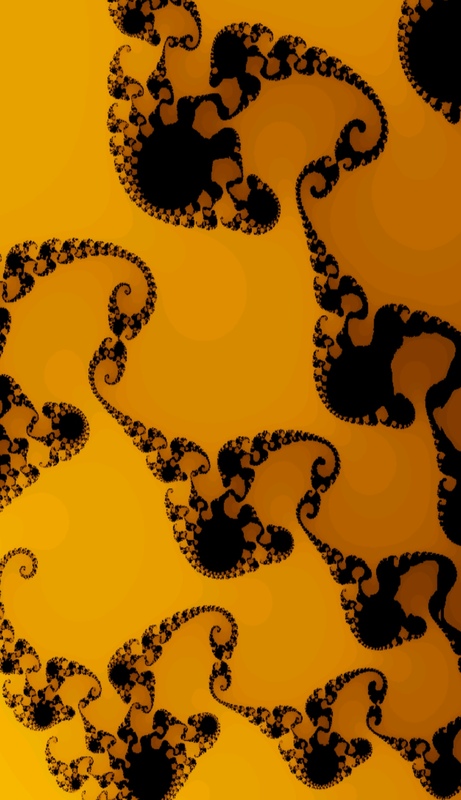 L-systems can also be used to generate self-similar fractals like the Mandelbrot set. The method is computer-executed, a process of construction. The artist is able to originate the image, adapt the rules and determine the final result. Uncertainty and chance are used to generate variations on a theme. The artist makes an initial choice from a gallery of images and uses it to walk a choice path of push-button random transformations for lines, shapes, colors and other parameters. Finally, several parameters can be changed to manually adjust and personalize the image. The method varies from selection to a process of play or construction. 'Raster' refers to the format in which images an be stored as well as to a mainstream in painting that makes use of this format. Colors and lines are registered pixel by pixel on the canvas. Apart from raster paintings, photographic images are also stored in the raster format. In procedure as well as appearance, raster or 'grid' or 'bitmap' painting resembles most closely a traditional painting with real brushes and paint. The image is created on the screen in a stroke-by-stroke manner. All the characteristics of the individual painter's hand are preserved. The only digital trait is the flatness of the physical carrier. Problems with enlargement are the main disadvantage. Often, the length and width of the creation is as small as a (mobile) computer screen and the resolution as low as 72 dots per inch. If the image is to be transferred to a physical carrier of customary size to mount on a wall, it has to be enlarged considerably. This generally entails manual correction, a tedious and time consuming process which is a serious obstacle for printing and selling. In recent versions of some raster painting programs, 'scripting' allows the painter to replay the brushstrokes on a larger canvas on the desktop (see 'size, resolution, enlargement'). 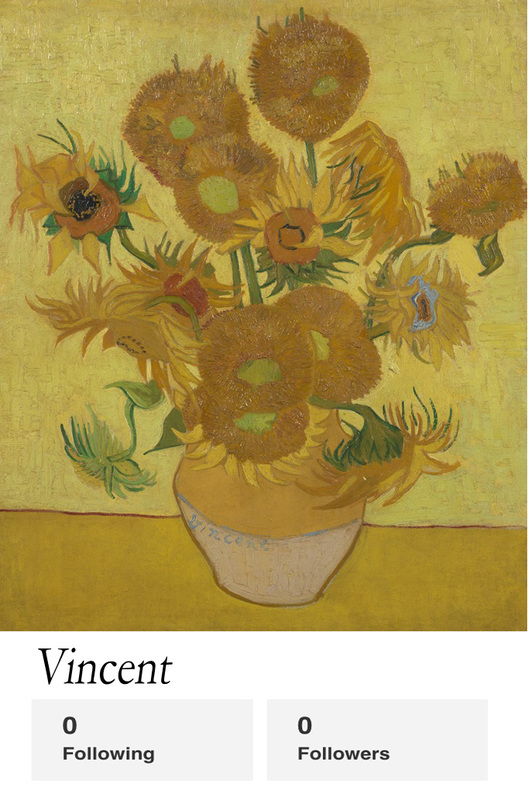 'Vector' refers to the format in which images can be stored as well as to a mainstream in painting that makes use of this format. All lines and shapes are captured into geometrical formulas. They obey to one-click operations such as change color, make transparent, emboss, flip, group, cast shadow, etc. 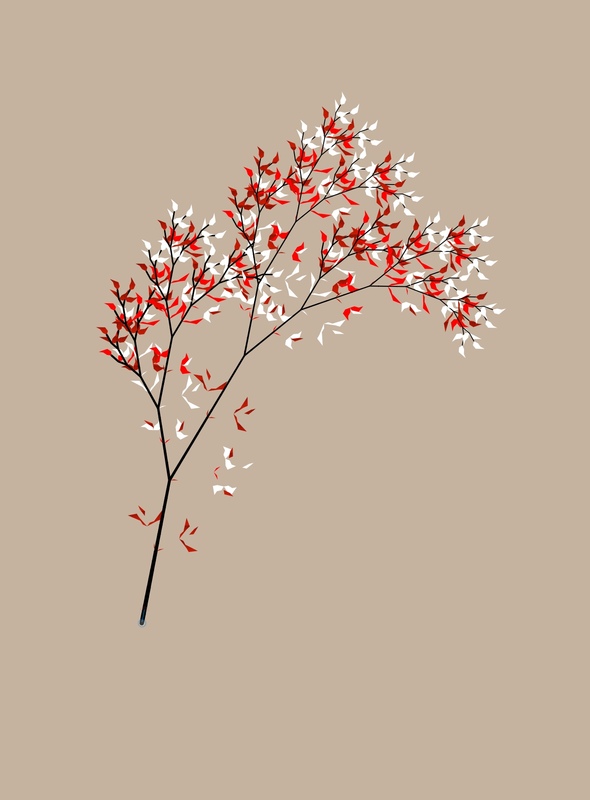 Apart from manual vector paintings, computer generated paintings are sometimes stored as vector. Manual vector paintings have the advantage that files are small and can be enlarged without loss of sharpness simply by entering different values for length and width. Size and resolution can be set to the maximum the printer can handle. The mathematical basis of vectors are 'Bezier curves', named after a French engineer who developed them in 1962 for the automobile design at Renault. A manual vector painting is created by choosing basic shapes like circles, triangles and squares, or by painting them freehand, and transforming them with special tools. 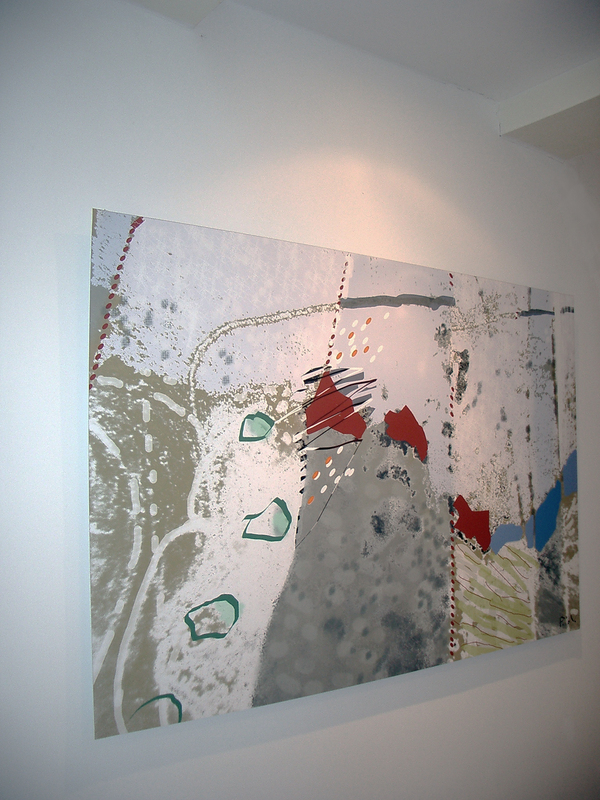 The painting process is somewhat like sculpture and less suitable for intuitive, spontaneous work than raster. The formula-based method leaves little room for characteristics of the individual painter's hand. The personality of the maker can still be felt in aspects like the choice of subject, composition, palette and gradients, atmosphere, concept of a painting etc., Although it can to some extent be simulated by forms, there is no brushstroke. Painting media are sometimes combined, either by using different software for the same painting or by using a program for hybrid painting. Vector-raster painting combines the personal brush style of raster with the formula-based lines and forms of vector. The use of different software offers maximum contrast between sharp and soft and between the mono- and duo-colors of vector and the very broad palette of raster. 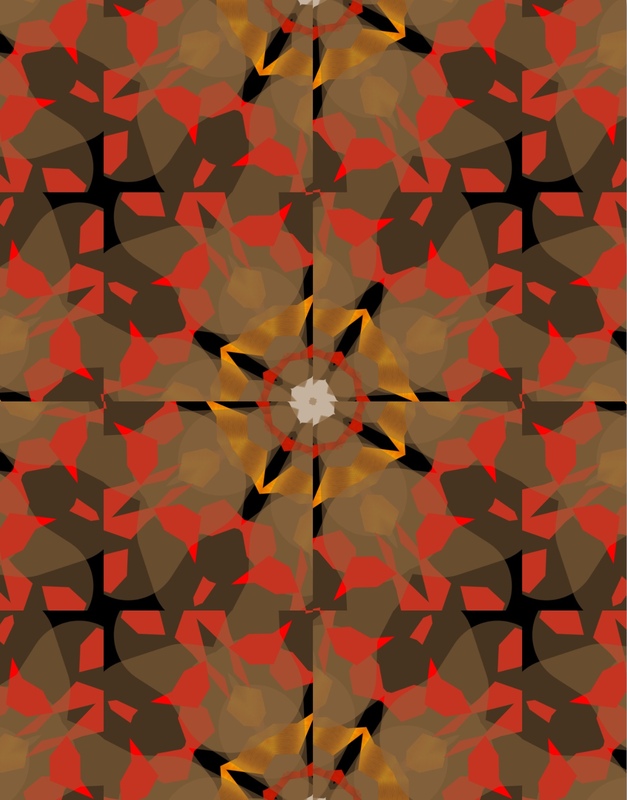 Other popular combinations are manual vector with computer generated, and photography with raster or vector painting and with computer generated. Some hybrid painting programs (e.g. 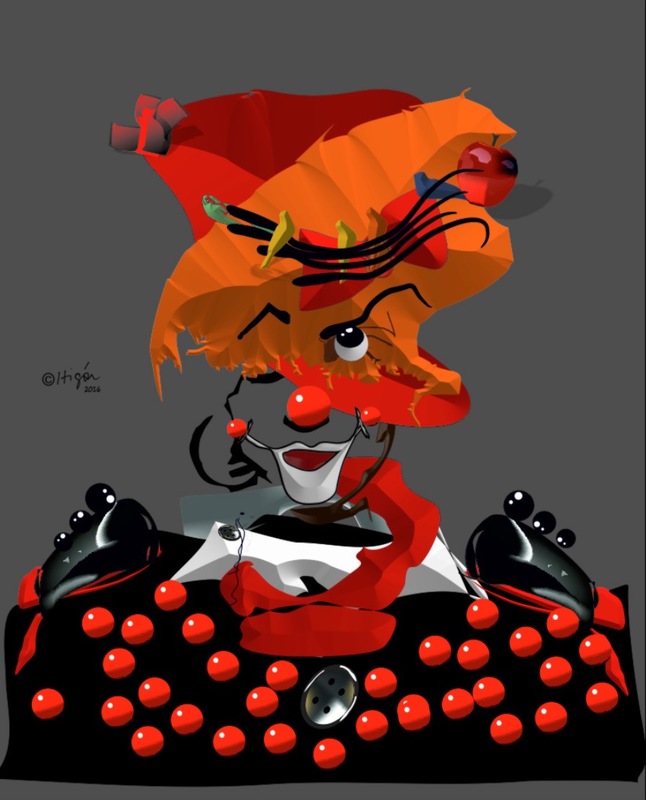 ArtRage) use Bezier curves in the background to smooth lines and curves of raster paintings without intervention of the artist. The painting procedure is spontaneous, stroke by stroke, and the storage format is raster. The smooth, non-raster, non-vector appearance reflects the hybrid basis. Smoothing mitigates the loss of resolution and eases the task of enlargement when the software does not offer scripting. The relation between painting and photography is centuries old, but never before has it been so close. To place a picture on a digital canvas and transform it into a painting now requires nothing but a push on a button, and a photographer today uses the same software for editing and transforming a photo as the artist for creating a painting. The shared toolbox entails changes in painterly development (see below) and creates a new transition zone between painting and photography. A variety of media filters can make photos or screenshots resemble an oil painting, watercolor, wood-cut, etching, etc. 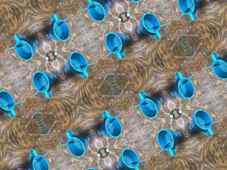 Style filters can put them in the visual framework of Seurat, Van Gogh, Pollock and many others, and form filters create effects like circle, wave, multiply, mirror, swirl and shear, or break up the image in a kaleidoscope of geometric forms that radiate from a central point in perfect symmetry. While these transformations are push-button, they are often part of a more complex method that combines several kinds of photographic, computer-generated and painterly aspects in subsequent stages. 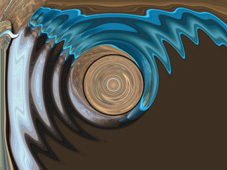 A possible workflow might be: a screenshot or photo is taken, subjected to a transformation like a swirl and put on the canvas as component of a painting. Applied as mixed media, new photography makes an important contribution to contemporary visual language. The storage format of photo-based art is raster. When the artist increases the height and width of an existing image, its resolution or information density decreases and it will become vague. Resolution is usually expressed in dpi (dots per inch). While the image on the screen already looks sharp at the standard resolution of 72 dpi on the web, a physical carrier needs 300 dpi or more to look sharp. Moreover, the physical carrier is usually much larger in height and width as well. For a vector painting, where colors and lines are controlled by formulas, enlargement requires nothing but a push on a button. There is no loss of resolution. For raster painting, information will have to be added to fill in the gaps. This is done with the help of enlargement software or by the 're-size' option in the painting program. Automatic enlargement usually needs manual corrections. Although much progress has been made in automatic enlargement, it remains difficult to fill in the empty space between handmade lines and shapes. Lines become unsteady and crumbly and unintended 'noise' appears along the edges of color patches. 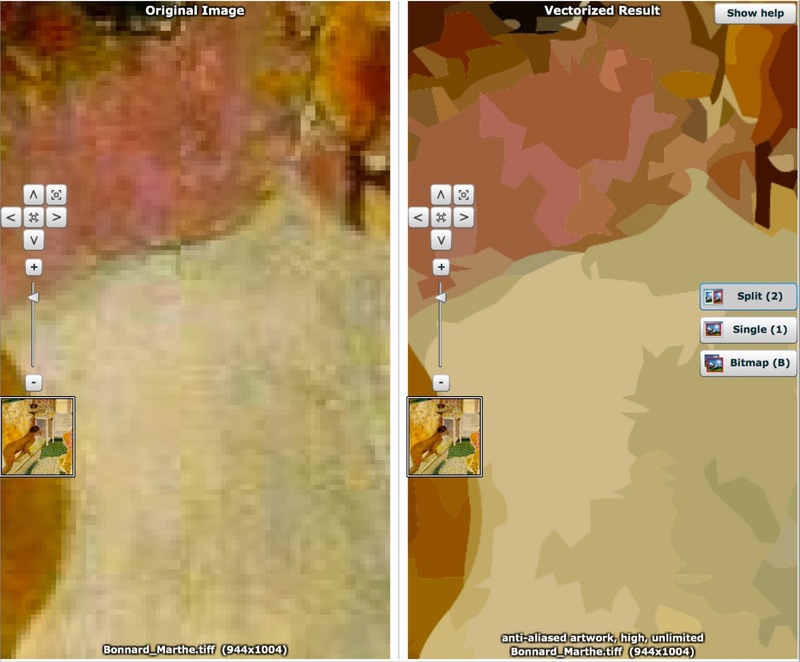 The image above shows two different types of online enlargement of the same fragment of Pierre Bonnard's Getting out of the bath. Note that each entails its own noise and deformation. In order to eliminate deformation and obtain a faithful representation of the original, automatic enlargement is usually followed by manual correction. Depending on the speed of the computer and the chosen size and resolution of the image, correction can be slow or even come to a halt. The screen, of course, is not enlarged: the artist can no longer see the whole image and has to zoom in and out, switching between corrections and reviewing the results. Depending on the size of the file, the slow and detailed process compares to fine needlework. Recently, several programs for raster and hybrid painting introduced ‘scripting’. Strokes and actions that compose the image are recorded and can be repeated in an automated process and without loss of resolution on a larger canvas on the desktop. For artists and collectors alike, a faithful representation of colors is of prime importance. Every computer screen deviates to some degree from the 'true' colors that are set as a standard by the international color convention (ICC). These deviations can be corrected by a calibration of the screen. For anyone working with colors it is necessary to calibrate the screen regularly. It is done with a small sensor that calls up a number of colors on the screen, compares them with the standard values and creates a monitor profile which is automatically installed as the default. It runs silently in the background and has only one task: to keep the individual screen fixed to the standard. Although, confusingly, this profile is listed between a whole range of optional profiles for printing, it should be left alone. It is not embedded in an artwork. In desktop painting software, the basic profile types have their corresponding palettes and matching color spectrum in the workspace. It is advisable to work in the palette and the spectrum that matches the destination - CMYK for printing, RGB for online display and grayscale for black and white. Changing RGB to CMYK profiles is not (yet) possible on mobile devices. The artist should embed a color profile in the finished artwork that matches one of two destinations: a webpage or a printing company. This is important because the color palette for printing is much smaller than the palette of a computer screen. If the artist sends a painting to the printer that has the RGB profile for online display embedded, every color that is not available will in an automated process be translated to neighboring color that can be printed. The result can be disappointing. This is especially relevant for painters working on mobile apps because they have the RGB profile embedded in their artworks. A desktop painting program should be used to convert RGB colors to a CMYK profile for printing. Most printing companies supply their own profile, tailored to the machinery, ink and choice of paper. They can also prescribe one of the CMYK profiles that are available in most computers. Some accept files with the RGB profile and convert them to their own CMYK profile. Only 216 colors are standardized between browsers. The artist who wishes to avoid online color deviation has the option to use the 'web safe color palette'. However this seriously limits the choice of colors. (1) The screen should be calibrated. (2) The artist should paint with the color palette that matches the destination. If this is not possible, paint in RGB and convert to CMYK before sending the work to the printer. (3) The right profile should be embedded in the artwork, RGB for digital destination and CMYK for a printing company. Galleries use RGB files for online presentation to offer physical prints. The RGB color palette is used as it is or auto-converted to the CMYK palette. Small or large color deviations are inevitable, especially if bright or 'psychedelic' colors have been used. If accurate color representation is important, the artist can order a proof from the gallery before offering prints. Approval of a proof can be mentioned in the description of the painting. Over the centuries art lovers have felt the hand and mood of the painter in brush strokes and paint. Many find that a painting without texture is fine in a book, but doesn't feel right on the wall. Though a stylus can be as sensitive to the pressure of the hand as a traditional brush, and the pressure can be made visible on the screen, a digital painting is entirely flat. Some artists accept flatness as a property of digital painting. Many print or project their work on a physical carrier and paint it over, thereby using the computer as a preparatory device and sacrificing the digital characteristics. Brushstroke gel is widely used to simulate brush strokes on a printed canvas. In traditional painting, the numbering of a limited edition by convention follows a quality/quantity notation 'i/n' in front of the artwork. Where 'i' indicates a rough ranking of the individual print according to technical and aesthetic quality and 'n' is the size of the edition. Since all prints of a digital artwork are identical, 'i' has no other meaning than to let a buyer know how many prints are still available. The meaning of 'n' is still the same: the size of a limited edition has economic significance for collectors. As in traditional painting, the size of 'n' is set by the artist prior to the first sale. The artist keeps register of the number of copies that are sold. Open series are referred to as '∞' and numerically unique prints as '1/1'. In the automated printing process, the unnumbered run-up prints that are traditionally labeled as 'E.A.' (epreuve artiste) or 'A.P.' (artist's proof), can still occur. A great variety of digital tools brings the artist new means to express thoughts and feelings. 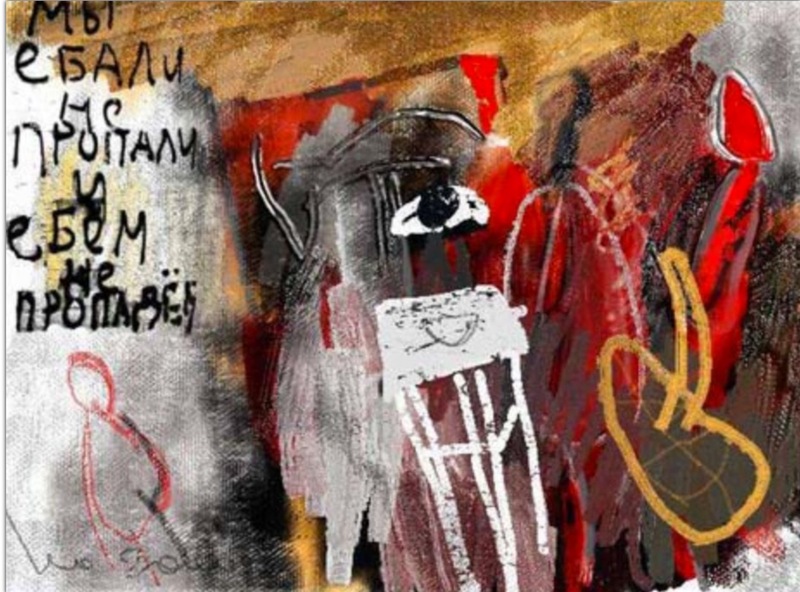 On the negative side, the more the computer facilitates their work by offering easy imports, taking over painting processes and offering a wide array of styles and transformations, the more difficult it becomes for painters to develop their own idiom, to take distance from images that are already created and to make the voice of the computer secondary to their own. The choice for an app narrows to some extent the development of the artist by limiting him or her to the possibilities and the style of the software. Further development is a process of interaction. A considered choice of a painting app should also take into account the risk that a software developer will not be able to keep up backward integration. In such a case paintings created with older versions of an app may no longer be available for transfer or printing. In order to eliminate the color bias of the individual screen, it is important to regularly calibrate (see 'about colors'). Even with proper calibration, it is difficult to assess the look and feel of a painting online. Colors to some extent vary with the physical carrier of the artwork and with the type of screen of the spectator. Moreover, many online colors in the online presentation simply can not be printed at all, even with the right color profile embedded. The best way to judge a digital painting is by a sample. It should have at least the size of a postcard, be printed on the chosen physical carrier (paper, acrylic glass, aluminum etc.) and executed with the same resolution and by same printing company that prints the final artwork. Collecting digital art starts with browsing and research. To browse the many online portfolios is not yet as easy and pleasant as it can be. There is a great deal of room for improvement in search algorithms. At the time of writing the search process has several serious limitations. Galleries with 'follow me' and 'thumbs-up' features rank artists by their number of followers, number of likes, and number of paintings in their portfolio. The artistic value thus measured results in increased visibility for some and decreased visibility or invisibility for others in search results. Though stars and thumbs are a common way to valuate all kinds of products, application to art and literature is an issue. Some critics have posited that thumbs-up could be a contra-indication for artistic value. Despite the invitation at some galleries to filter for mainstream digital media like ‘vector’, ‘raster’, 'fractal', 'new photography' etc., as yet few are able to live up to promise. It should be realized that a collector usually does not know the name of the artist. Therefore, if the medium search key doesn't function properly, artists remain invisible. The quality of a search machine is easily assessed from the results. If it is good, a more or less homogenous catch of paintings in a particular medium is brought up. If it presents an incoherent mix of all kinds of digital and non-digital media, there is a visibility issue. Search results can be supplemented at other galleries and Google images. 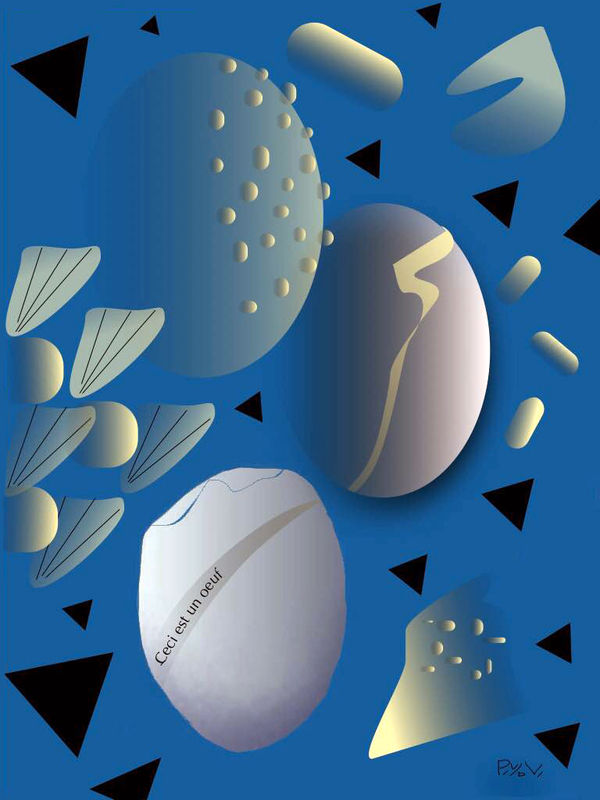 Information about resolution or the number in a limited edition are also often not yet included in artwork descriptions. Search results are often dominated by large numbers of images by only a few painters. If collectors tire from so much homogeneity and decide to resume at another time they will have to go through the same images again. Some galleries lower the resolution of paintings to speed up browsing, which results in blurred images. While frustrating to artists, it deprives collectors of the more time-efficient method of judging sharp small-size images at first sight. It remains important to buy from a trusted party. While most digital painters are still alive, their work can be bought directly at their website or at online galleries where they show their portfolios. Buying directly from the artist has pros and cons. The color quality of the print is a pro, if the artist will embed a proper CMYK color profile for printing, make corrections when needed and has the work printed at a professional printing company. Galleries use the RGB files for online display for prints, with inevitable small or large color deviations. On the other hand it is not easy for individual artists to match the attractive display and safe buying framework with payment, delivery and professional sales conditions that the galleries have to offer. If features like an approved color proof, a sample, a manual signature, protection against duplication and a certificate are not mentioned in the description of the artwork, the collector can suggest to make these provisions. For prints that are produced by the gallery, a signature and a barcode or other protective measure an usually be arranged by having it sent through the artist. The market for digital art is gradually maturing. Collectors start to realize that digital painting is a new visual language that can't be expressed with traditional means. Many problems have been solved. Color representation has become fairly reliable thanks to calibration and the use of color profiles. Digital and physical asset management and a responsible handling of digital files have brought the risk of duplication down to an acceptable level. Slowly but steadily, digital paintings are finding their way to museums, auctions and galleries where they meet a new generation of collectors. Yet many highly professional, even pioneering digital painters lack the technical know-how to get their work out of the computer and into the real world. Most rely on an online gallery. The larger galleries offer an abundance of originals and limited edition quality prints worldwide with good sales conditions. This relieves artists of technical concerns. On the negative side, if printing is left to the gallery and the print sent directly to the collector, the artist can no longer evaluate and if necessary adjust the (color) representation. Physical asset management such as a manual signature is somewhat more complicated, and the computer of the artist is no longer the only location where a high resolution file of the painting is stored. A certificate is a document that bears a mark of identity such as the signature of the artist, often supplemented with a personalized sign, watermark, bar code, fingerprint or hologram which matches an identity mark on or in the artwork. It contains a copyright declaration, distinguishes between an original and an open or closed edition, states the size of a limited edition, binds the artist to deletion of the digital carrier after the sale, and conditions the display of the artwork after it is sold. A Certificate of Unicity for a numerically unique print ('original' or '1/1') a Certificate for a Limited Edition and a Certificate for an Open Edition is regularly updated and freely available on this site. MOCA Museum of Computer Art (MOCA) of New York State University offers emerging directions in digital art an online platform since 1993. Annual juried competition in digital art, catalogue. Update of 'New Photography', update of 'Collecting, browsing online galleries'. Update of 'DP, brief overview'. 2019/04/10 Update of 'Digital painting and photography'. Update of 'Collecting digital art, assessment'. Update of 'Differences in method.' Update of 'Digital painting and photography'. Added images. 2019/04/04 Update of 'Computer generated painting'. Update of 'Differences in method'. Update of 'Collecting digital art, assessment'. 2019/02/12 Update of 'Visual characteristics'. Added tip jar.